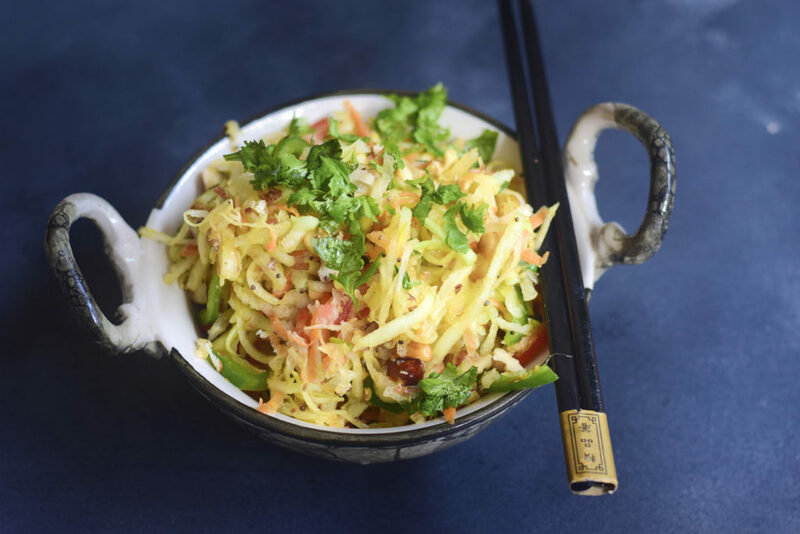 Raw Papaya Salad | How to make crunchy raw papaya salad with mustard and roasted peanuts. Make this healthy and crunchy salad at home with just a few ingredients. It is also vegan and gluten free. Make the marinades or spice mix are for salads in a mortar and pestle. Food releases their juices and amalgamates the flavors well. 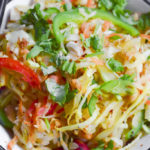 You just need some shredded or julienned carrots, raw papaya and green capsicum.The crunchiness comes from roasted walnuts, peanuts and almonds. Temper the salads with coconut oil. It has numerous benefits. It also increases fat burning in the body. It’s also reduces hunger and helps you eat less. If you are on a diet , this is a good reason for you to marinate or temper your salads in coconut oil. Ayurveda says that 30% of your daily diet should be consumed raw. You should make salads an integral part of your diet routine. 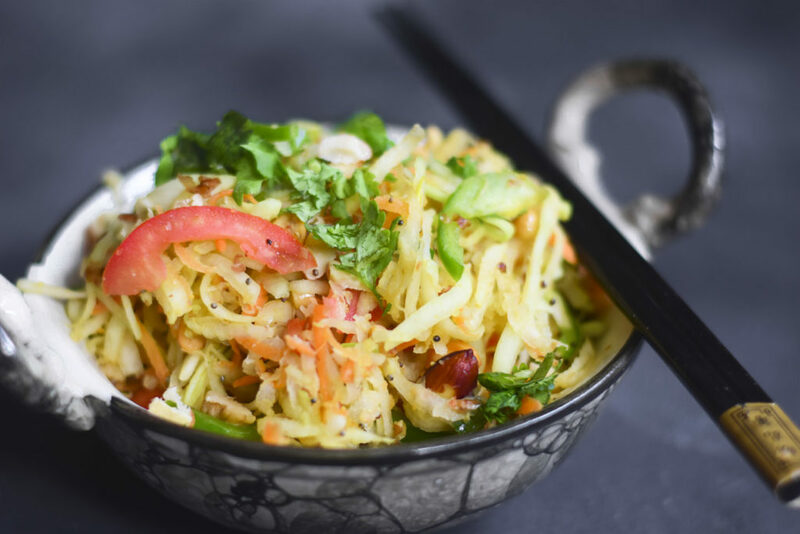 A few other on the blog are : Chickpea fruit ‘n’ nut salad , Mango salad with cumin vinaigrette , Indian Vegetarian Boondi Salad. Try these amazing salad varieties to have a complete meal. 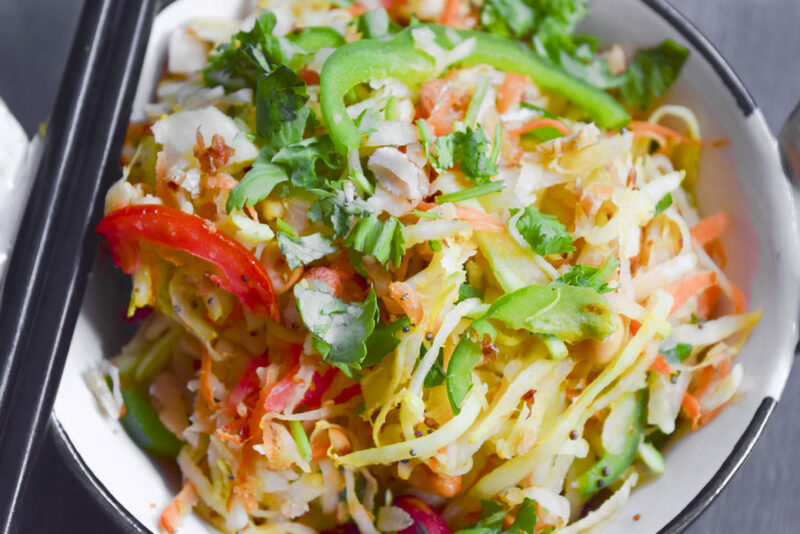 Raw Papaya Salad | How to make crunchy raw papaya salad with mustard and nuts. Shred or julienne the raw papaya , carrot, tomato and capsicum. Keep aside in a bowl. In a mortar and pestle, crush the green chili, ginger and garlic and add it to the shredded papaya mix. In a tempering pan, add the nuts and dry roast them. For extra crunchiness you may add a few drops of coconut oil.But that's completely optional. Keep this aside. How to prepare the Tempering: Heat a teaspoon of coconut oil in the same pan and add rai seeds/ mustard seeds. Let them splutter and add the curry leaves. Break the curry leaves with your fingers nicely before adding to the oil. Add this tempering on to the papaya mix and mix well. Squeeze 1/2 a lemon on top of the salad and mix well. Add salt to taste. Add some of the nut mixture now and mix well. For garnishing: Add the rest of the nut mix , coriander leaves and serve . You may also refrigerate the salad for 1/2 hour and then serve cold. Virgin Coconut oil does not leave any aroma or aftertaste.